Heading into today, a total of 20 bracelets have been won thus far at the 2014 World Series of Poker. There have been a fair share won by “known” players to this point -- seems like a lot, doesn’t it? I would imagine most of those who follow poker would recognize at least a third, perhaps half of the players who have won events to this point. I knew of 12 of these players before, a couple of them (Kyle Cartwright and Kory Kilpatrick) thanks to having seen them do well at WSOP Circuit events in the past. Seems like a pretty high percentage of “recognizables.” I was curious to check that 25K Fantasy game and see how many of the bracelet winners so far were among the 96 players drafted. Looks like five of the 20 winners were selected -- Vanessa Selbst, Paul Volpe, George Danzer, Brock Parker, and Justin Bonomo -- and really among the ones who weren’t taken, none really stand out as huge misses. No one drafted Ted Forrest or Davidi Kitai (both multiple bracelet winners coming in), but in neither case does that stand out as an alarming oversight. 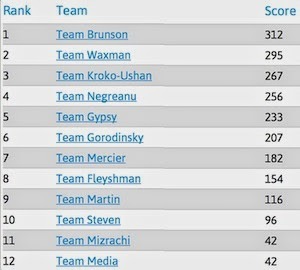 Was wondering how that clip of picking winners compared to last year’s 25K Fantasy draft, and after a quick run through to compare the 112 players selected (by 14 teams) and the 62 bracelet winners, it looks like a total of nine champs were drafted -- Mike Gorodinsky, Mike Matusow, David Chiu, Erick Lindgren, Jesse Martin, Marco Johnson, Steve Sung, Eli Elezra, and Daniel Alaei. Looking over the undrafted 2013 bracelet winners, only Tom Schneider (who won two) seems like a big miss. So their rate of drafting winners is better so far this year -- 25% to just under 15% in 2013 -- for whatever that’s worth. I suppose it’s safe enough to theorize that the better the 25K Fantasy teams do drafting bracelet winners, the more likely it will be those who win bracelets will be recognizable players prior to their victories. 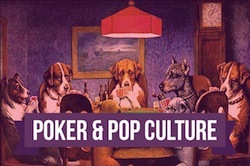 That’s not to say that the 25K Fantasy drafters are perfectly representative of the WSOP-following public, but their picks do offer a general idea of who are the best known and highest regarded WSOP tourney players. Meanwhile, it appears that a third of way into the summer Team Media needs a jump start and PDQ.